I figured today was the perfect day to share about our recent trip to Beetle House in NYC. 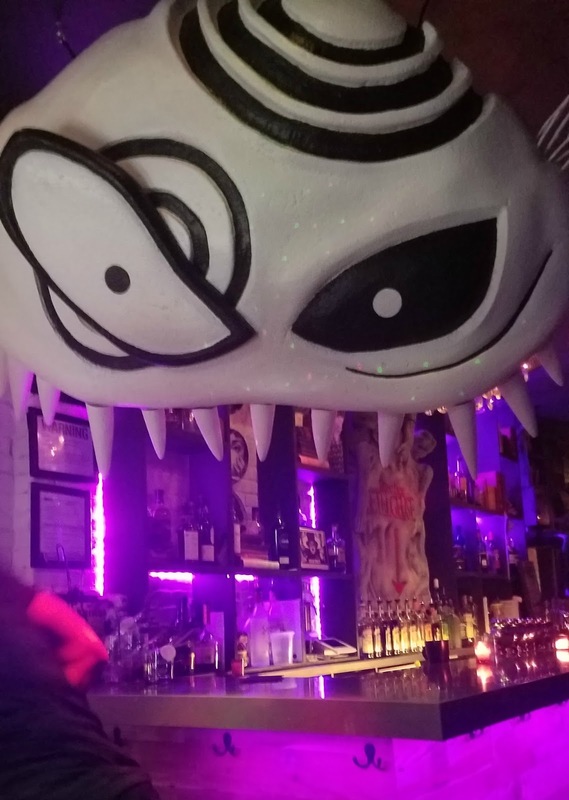 Beetle House is a restaurant based on all things Tim Burton, from the decor to the menu. Since David is a huge fan of Beetlejuice the movie, I knew he would love it there. I started looking for reservations as soon as David and I bought our New York Comic Con tickets but it was booked for months in advance. I was lucky enough to get a same day reservation the morning of Comic Con so I surprised Dave as we were leaving the Con. Beetle House is located in the East Village and is a very small restaurant, which is probably why reservations are required to dine. The entire place consisted of a bar that holds roughly 10 seats, and or 5-8 dining tables depending on the configuration. We were lucky enough to get the front window booth so we had plenty of space but some of the tables in the back were a bit more cramped. I'm not sure our bags would have fit under the table and there was no room to put them down otherwise. 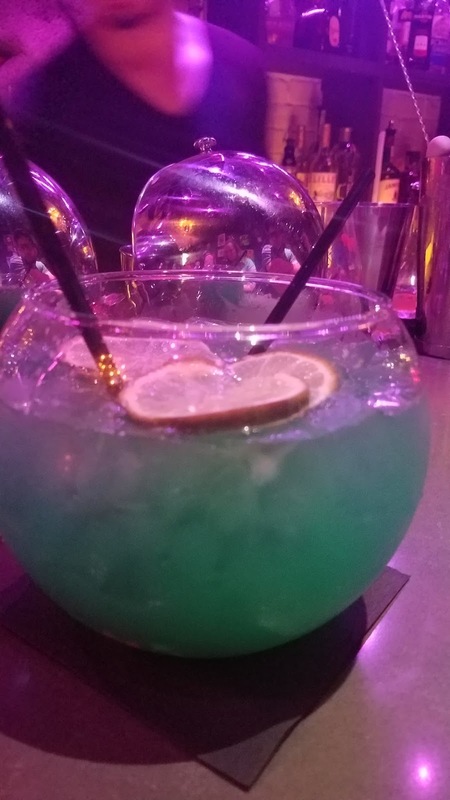 We started off at the bar while we waited for our table and ordered a Fishbowl drink to share. 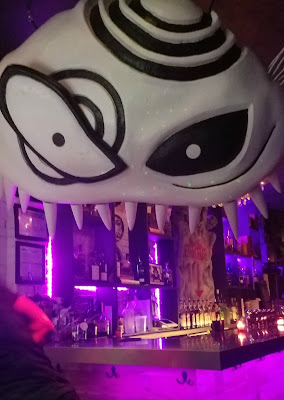 The bartender was energetic and personable and put on a show as he made it. The drink was made with Nerd candies,and finished off with Swedish Fish. Seriously so good. I'm pretty sure I could drink it on my own. Before we could finish it however, they brought us to our table. I loved our seats not only for the space, but for the great view of the bar. 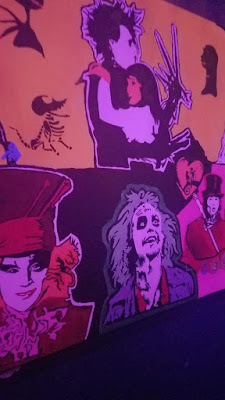 Like I said, the whole place pays homage to Tim Burton so the place was covered in art from movies like Edward Scissorhands, Beetlejuice, and the Corpse Bride to name a few. Even though they are not officially attached to Tim Burton, they use creative license to make the food inspired as well. 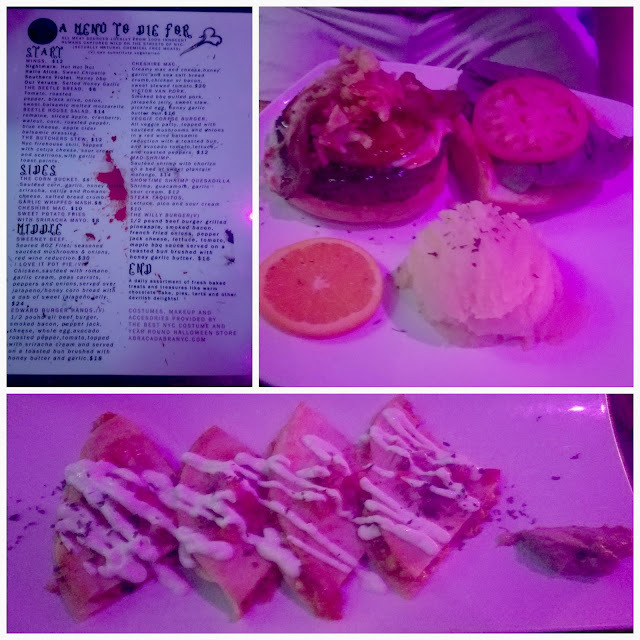 Items like the Cheshire Mac or the Veggie Corpse Burger sit on the menu. David ordered the Willy Burger and I had the Showtime Shrimp Quesadilla. Dave's burger was delicious. Cooked perfectly and topped with bacon, pineapple, fried onions, and maple bbq sauce. My quesadillas were the perfect sized portion and stuffed with cheese, shrimp, guacamole, served along side a garlic sour cream. The flavors are ecclectic but so delicious and the chefs put on a show. 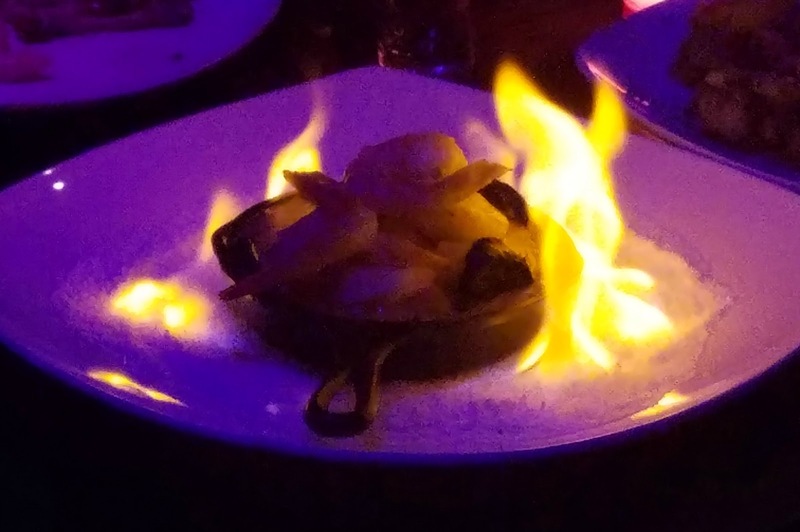 The Mad Shrimp is served while still engulfed in flames! 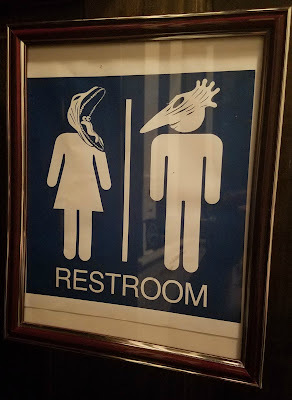 Eating at Beetle House NYC is truly an experience. I am so happy that we were able to get last minute reservations! The place is booked months in advance so I advise that you look for a Sunday reservation, which is when we could get one, or plan ahead! Dave and I seriously can't wait to go back. Disclaimer: I was provided bracelets to facilitate this review, however all thoughts and opinions are my own. I feel like 95% off the packages that show up to my house are for the kids so I was beyond excited when these gorgeous bracelets showed up last week. I've seen Pure Vida in a couple of local boutiques so I looked into the company even more after they arrived. I love the premise of them: two guys go on vacation and fall in love with the culture. They ask locals to create 400 bracelets to take home with them and the entire line is created. 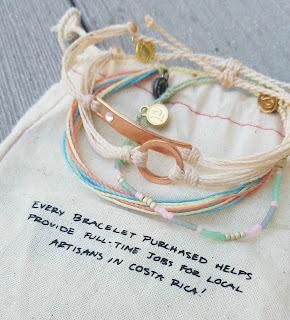 Each bracelet is hand crafted and amazing quality, plus each bracelet supports local artisans. My jewelry box still holds beaded bracelets from my service trip to Belize so it got me right in the heart. 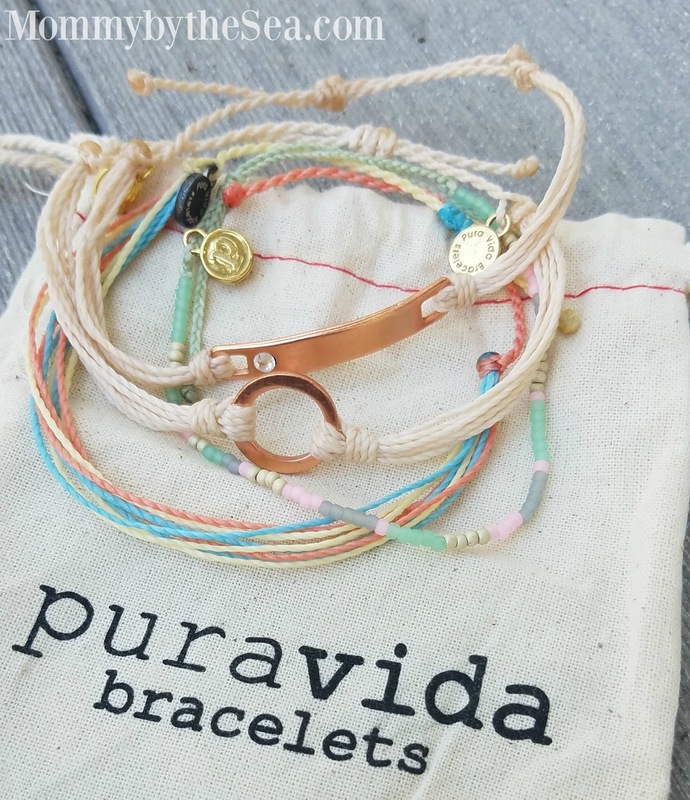 The Pura Vida Charity Collection was created to give back to different causes all over the world. Pura Vida is partnered with over 190 charities and have donated more than $935,358 to date. Some of my favorites are Anxiety Awareness, Breast Cancer Awareness, Depression Awareness, Autism Awareness, and Mental Health Awareness. They also donate 1% of their annual net revenue to environmental organizations worldwide. The goal to continue to expand the charity line and support as many causes as possible. You can check out Pure Vida's full selection of bracelets on their website as well as their accessories and clothing line. The real question just becomes, do you buy them for yourself? Or as gifts? 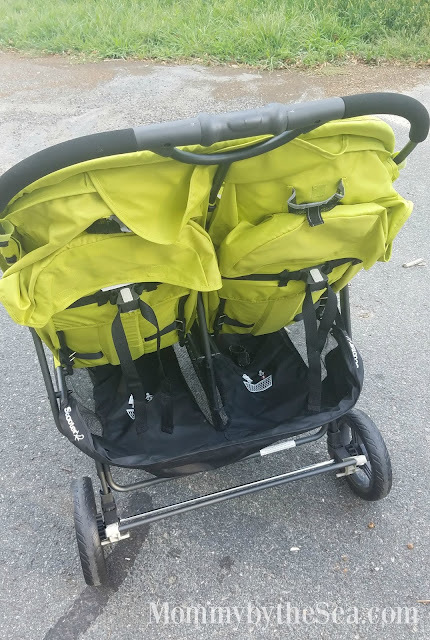 Disclaimer: I was provided with a stroller to facilitate a review, however all thoughts and opinions are my own. We had a couple of super warm days in the past week and I've really loved getting in a few more warm walks, holding on to our warmer days. As much as I love our VaryLight Tandem Stroller, I've been looking for a side by side stroller for our walks. I had a jogger but it was super old and run down, even missing the front tray/bar. Not exactly perfect and when the tire started going flat, I knew it was time to upgrade. The amazing people at Joovy sent us this gorgeous ScooterX2 and I am just in love. Like always, Joovy offers it all in a gorgeous design. 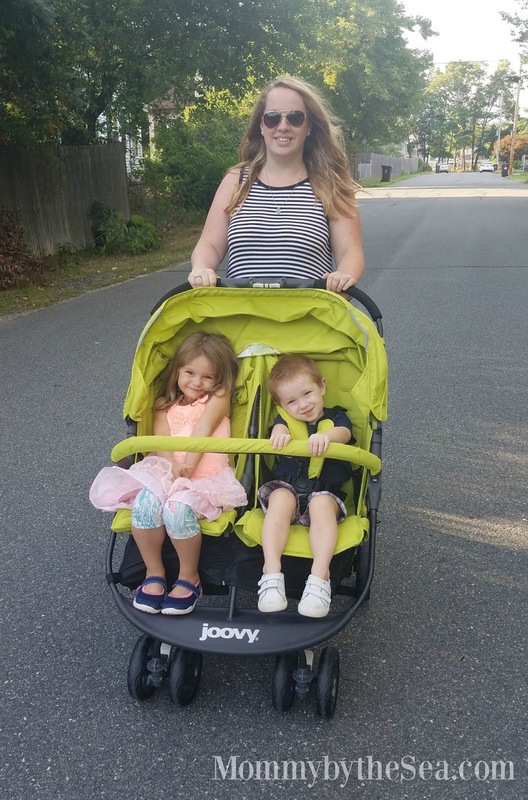 The double stroller holds two children, each up to 45 lbs, but still offers the convenience of fitting through our doorway! The seats recline individually and I honestly love the set up. You simply loosen up the strap to recline and pull the strap tighter to sit the seats upright. The front offers a footrest for my tall kids and a safety bar to help keep them in. There is a huge canopy that keeps them completely tucked away from the sun when needed but it offers a big viewing window for me to keep an eye on them! Each seat has a mesh cup holder that is great for storing my water bottle or my house keys while we're out. The huge basket was perfect for us when we went to the Jack-o-Lantern Spectacular and brought along my purse, some blankets, diaper changes, and some snacks! 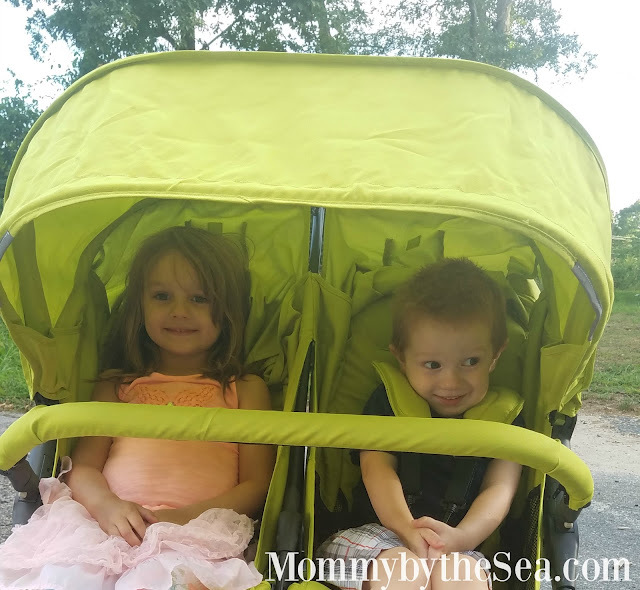 I'm a huge babywearer, but this stroller is perfect when both kids need to be pushed around, like our town fair and looking at pumpkins! My favorite part is that, like the VaryLight, the ScooterX2 offers a 1 handed fold! It's so simple to open and close and is light enough for me to lift in and out of the van. I love the vibrant, gorgeous color of our ScooterX2, but you'll have to check out the full listing on the Joovy page and let me know your favorite color! Disclaimer: I was provided product to help facilitate this review, however, all thoughts and opinions are my own. Did you see our adorable Pokemon themed costume post on Instagram over the weekend? I'm very excited for Halloween this year, which isn't the norm for me. Both of my kids are old enough to enjoy dressing up, understand trick or treating, and are counting down to the holiday, which in turn, means I'm excited as well. Emma has been adamant about being Misty from the Pokemon for weeks now, but a small package arrived on our doorstep this weekend and now she's not sure. I met the Great Pretenders at Toy Fair back in February and instantly knew that Emma would love the company. 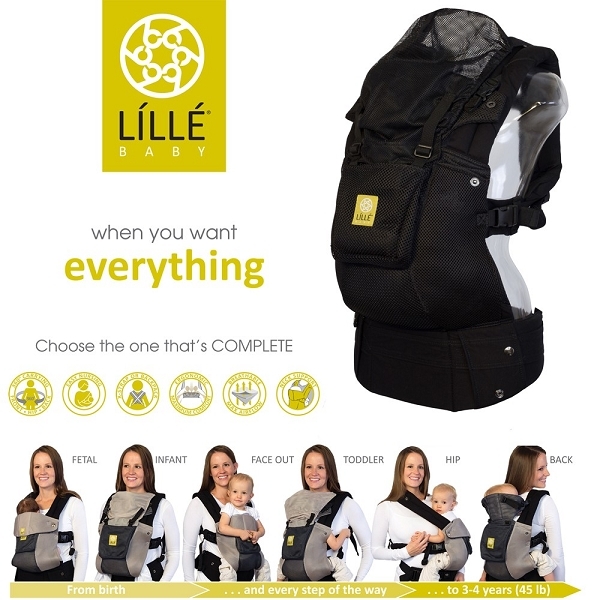 The outfits themselves are such great quality, nice sturdy outfits that can handle my children playing in them. I was torn between getting Emmalee a new Frozen Ice Queen dress or a cheerleader but she's been so into the Patriots lately, literally running around our house in a white sports bra, her blue and white striped skirt, and her Patriots bow (by McClure House Designs), cheering during each game.... 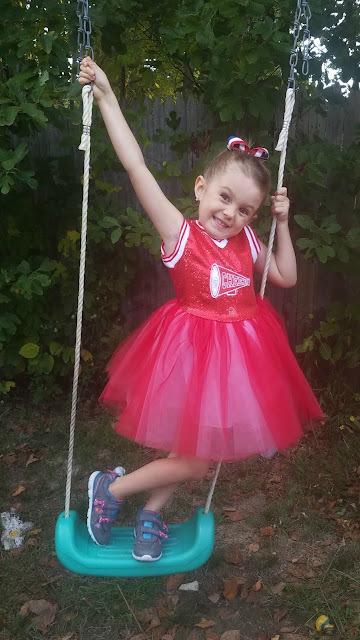 I had to get the cheerleader outfit. I wished I had recorded her face when she opened the box. She immediately ran to her room to go put it on. What made me laugh even more was that Tyler ran to his room and came out with his Patriots jersey. 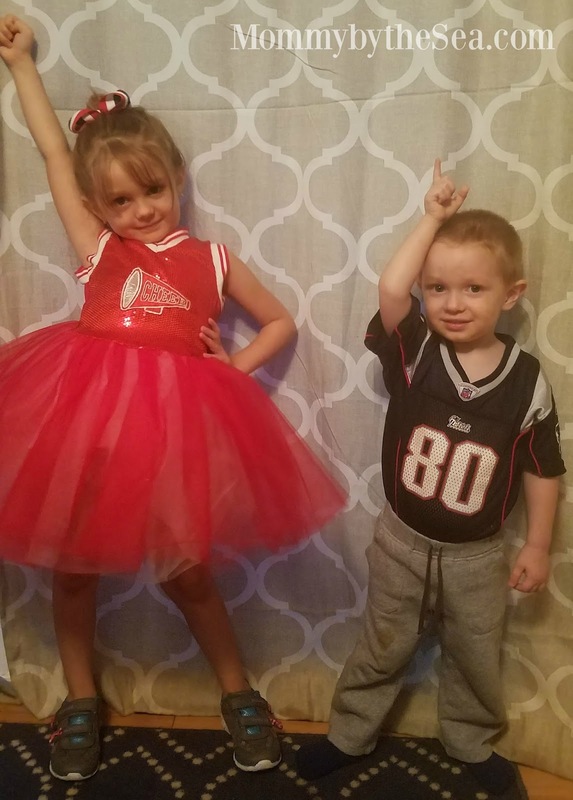 The kids loved playing in the living room, throwing a stuffed doll across the room, pretending it was a football while Emma made up the best cheers for him! I love any toy, product, or activity that pushes them to their creative side and this costume is no exception. Minutes later, we were outside being a "Cheerleader Circus Performer" on the trapeze. And I don't mind her being outside in it because... wait for it... it's machine washable! I'm not lying when I say it's sturdy enough for the washing machine, and comfortable enough for her to wear all day. As much as I love her cheerleader outfit, I've already found myself back on the Great Pretenders website, picking out more outfits that I think Emma would love. A few of my favorites are the Lightning Quick Adventure Chick, Mermaid Dress Blue & Lilac, and the Crystal Queen Dress. There are a handful of "boy" costumes as well. I say "boy" because there's no reason a girl can't be a dragon or a doctor, but I digress... I think Ty will love the Pirate set, the Doctor set, the Bat Cape with hood, or the Fire Breathing Dragon. 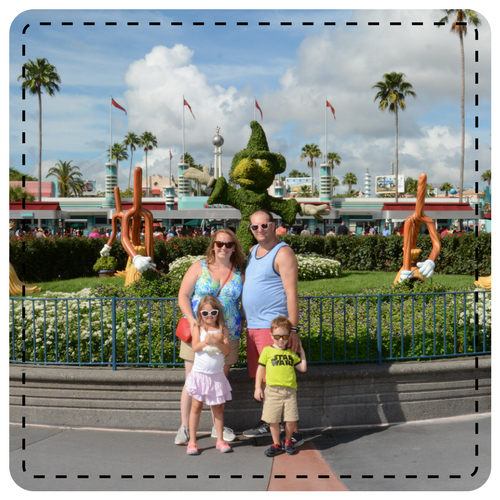 In addition to their website, you can find Great Pretenders on Facebook, Twitter, and Pinterest. You can even check out Emma on their Instagram! You'll have to leave her a comment there and then let me know which costume is your favorite here! Yikes, It's been a long time since I wrote. I find the September to December time frame is so hard for me, between juggling school and writing and with David working most weekends for some awesome overtime pay (Christmas is only weeks away! ), it's given me even less time to be able to sit and work. Most of that time ends up going to grading student work but fiiiiinally, I feel like I have a grasp on that so I have to spend some time writing. I love writing, I really do. 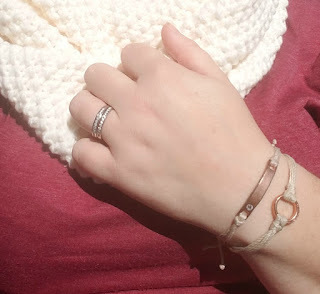 My blog has never felt like an obligation, but I do feel bad when it's put on the back burner so this is a quick catch up becuase there are so many posts coming in the next couple weeks! Little man is still getting speech services through the state (catch up here) and is doing so amazingly well. Since the last update, he has started day care as well, so a combination of two days of "school", plus 2 different speech supports coming during the week, plus a 3 hour play group once a week... it's really made a difference! Not only is he saying more words, including Em-ma, dada, hop, woof woof, gitty (kitty), boo, yey!, more... plus, he is signing more as well. He can currently sign more (which he now couples with the word), help, please, drink, eat, and bath. Even though he words aren't a huge improvement, his expression is! He has great inflections in his voice and can better communicate which means less frustration! Additionally, he's finally begun stringing words together, saying things like "Mama, boo-boo, woof woof? ", asking if the boo boo I have is from the dog...it makes me so happy to see him being so successful in what he tries to do! Kindergarten has been a bit of a transition for Emma. While she was initially concerned about school, what if no one wants to be my friend..., and riding the bus,"Mom, there are no seat belts, it's not safe", she loves school now. In fact, she loves it so much that she doesn't want to miss anything using the bathroom. Constant accidents at school led the nurse to call us to have Emmalee medically checked out but after 2 and a half weeks, Emma is much better, actually going without an accident this week! I know by 5 she should be trained already but she was so self conscious about others seeing her pull up in school, it did upset her. I'm so proud of her for working so hard to be successful. Unfortunately, the Pull Ups warranted some teasing on the bus which led to her coming off the bus in tears one day, and if you know me... you know that wasn't acceptable. It took less than 24 hours to have things taken care and a small first grader learning that you don't be fresh and pick on other students... Otherwise, she is dancing up a storm and loving dance again this year! She's such an emotional, empathetic little girl and I just love her heart so much. This man blows me away everyday. Somehow he is working full time, picking up a bunch of overtime, Christmas and Punta Cana are coming, school full time, and still manages to clean the house while I'm at work. He's the one who gets the kids to school, does the laundry, and tells me not to worry about the dishes or the rug if I have work to do at night. Seriously, how did I get so lucky? Literally nothing. Ha. There is nothing new with me at all. I work a ton and I bring a ton of work home with me. I've been struggling with my anxiety lately, feeling like I spend too much time working and some days, two kids.... oh man. But I know it could be so much worse and I need to keep that mentality. We just came back from my first Comic Con and had so much fun. I'll be writing about it later this month. I have a handful of amazing posts coming up that I'm excited to share because they are some of my favorite partnerships. I still question if I should be writing because I get a bit jealous when I see the calls others get about partnerships, but then I remind myself how much I love my full time job, and how much I love writing, regardless of the income and then I remember it's all okay. Thanks for sticking around and I promise you'll see much more of me this second half of the month! This post is a bit overdue, but I wanted to let you know about my friend Kelly who writes at She Triumphs.